Aladdin grants your wish of having an efficient way to collect smokers' waste. 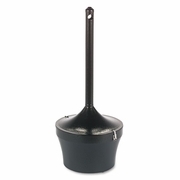 This sandless ash urn is made of durable fire-safe steel and has a galvanized liner. Powder-coated finish prevents unsightly cigarette burn damage. Handle removes for emptying. Wipes clean with damp cloth. Chained removable top prevents theft. Capped tube openings deter unwanted waste. For indoor, outdoor use. 16" dia.base 39" high.